Dan Welch came to bat for Spartanburg with no score in the fifth and reached on an error. Welch, though, couldn't turn that error into a run, making it to second in that July 1990 contest, but soon getting doubled off. Welch was in his second season as a pro that year playing at single-A Spartanburg. He was also in his last year as a pro, his brief pro career ending with the season's end. Welch's career began in 1989, taken by the Phillies in the 44th round of the draft, out of Christian Brothers University in Memphis. He went to Christian Brothers after graduating from Parkway Central High in Chesterfield, MO. 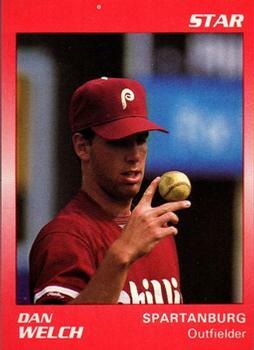 With the Phillies, Welch started at rookie Martinsville, hitting .311 over 39 games. He also hit four home runs and knocked in 17. For 1990, Welch moved up to single-A Spartanburg, but he couldn't take his hitting with him. Over 86 games that year, Welch hit just .175. He also hit just three home runs and knocked in 24. His combined average over the two seasons ended up at .218. At season's end came the end of Welch's career, Welch given his unconditional release.